Background and objectives: Autosomal dominant polycystic kidney disease (ADPKD) is an inherited progressive disorder associated with significant pain and discomfort affecting quality of life. This study determined the impact of pain medication use and other clinical, biochemical and genetic characteristics on the physical and mental well being of predialysis ADPKD patients using the Short Form 36 (SF-36) questionnaire. Design, setting, participants, & measurements: The authors prospectively evaluated ADPKD patients in the Cohort Study, funded by the Polycystic Kidney Disease Foundation. Data on clinical, biochemical, and radiologic variables were collected in patients who were given the Short Form-36 questionnaire. Variables independently associated with the Physical Component Summary (PCS) and the Mental Component Summary (MCS) scores were identified. Results: One hundred fifty-two patients had a mean PCS and MCS of 46.9 ± 11.3 and 51.0 ± 9.0, similar to the general population and better than the ESRD population. Eleven (7%) reported pain medication intake within 1 mo of evaluation and demonstrated lower PCS than those not taking pain medications. Patients with GFR ≥ 80 ml/min/1.73 m2 had greater PCS than those with GFR < 80 ml/min/1.73 m2. Age, BMI, pulse pressure, pain medication use, and education level independently associate with PCS and account for 32% of the variability of the measurement. Pulse pressure correlated with MCS. Conclusions: Predialysis ADPKD patients assess their quality of life similar to the general population. Age, BMI, pulse pressure, pain medication intake, and education level link to their physical well-being. Autosomal dominant polycystic kidney disease (ADPKD) is the most common hereditary renal disease, occurring in 1 in 700 to 1000 individuals, and accounts for 5% of the end stage renal disease (ESRD) population in the United States (1). Most affected individuals are unaware of their condition until the third decade of life, and no curative therapy is yet available. Dietary protein restriction, control of hypertension, or specific use of angiotensin converting enzyme inhibitor therapy have failed to demonstrate any benefit with regard to renal disease progression in ADPKD (2–4). It is possible that a known diagnosis of ADPKD could affect psychologic well-being similar other inherited disorders for which therapies are lacking (e.g., Huntington's disease) (5). ADPKD is characterized by massive renal enlargement secondary to cyst growth, leading to ESRD (1). Chronic pain is a common and significant component of ADPKD (6). In advanced cases, massively enlarged kidneys are associated with chronic pain, early satiety, and shortness of breath (6). In addition, superimposed episodes of acute pain related to nephrolithiasis, cyst infection, and hemorrhage are not uncommon (7,8), and a small number of patients require surgical intervention with cyst decompression to reduce discomfort and pain or narcotic medication intake. Renal size has been shown to be associated with the occurrence of hematuria and nephrolithiasis (7,8) and has been proposed to be related to the well-being of ADPKD patients. Although massive organ enlargement and pain both commonly occur in ADPKD, it is unclear whether quality of life is affected by these manifestations in ADPKD individuals. The Short Form-36 (SF-36) questionnaire is a self-administered standardized assessment of the quality of life and functional status of the individuals being tested. The test was initially made up of eight scales of health that are now summed into two scores, the Physical Component Summary score (PCS) and the Mental Component Summary score (MCS). These scores address physical and mental well-being within 1 mo of taking the questionnaire in patients with chronic illness and are standardized for the general U.S. population. Norms have been created for a variety of chronic medical conditions (9,10). They have been tested in a number of different communities (11), renal disease groups including dialysis populations involved in clinical trials (12), and pre-ESRD African Americans with hypertensive nephrosclerosis (11). Given the inherited, chronic nature of ADPKD and its associated significant physical morbidities, we hypothesize that ADPKD individuals will report a lower quality of life PCS and MCS of the SF-36 questionnaire than the general population. To test this hypothesis, we compared mean and individual component PCS and MCS scores between ADPKD individuals participating in a prospective observational study (the Cohort study) and other well characterized study populations defined by their level of renal function, need for dialysis, and community versus clinical trial environment. In addition, we determined which clinical variables, medication exposures, biochemical factors, or genetic factors in the predialysis ADPKD participants in the Cohort study were associated with the quantified physical (PCS) and psychologic (MCS) scores on the SF-36 questionnaire. This report is part of a prospective, observational study of predialysis ADPKD subjects sponsored by the Polycystic Kidney Disease Foundation. The purpose of the Cohort study is to develop a registry of ADPKD individuals to determine risk factors for progression to renal failure. After providing informed written consent, ADPKD individuals >6 yr of age were admitted for 2 d to General Clinical Research Centers (GCRC) at three sites; (Emory University, Atlanta GA; University of Oregon Health Sciences Center, Portland, OR; and Beth Israel Deaconess Medical Center, Boston, MA). All protocols using human subjects were reviewed and approved by the Human Investigations Committee of the Institutional Review Board at each participating institution, and informed written consent was obtained from each participant before entry into the study. Criteria for a diagnosis of ADPKD as defined by Ravine et al. were used (13). Subjects were ineligible to participate if they had entered ESRD; undergone any renal surgery or renal cyst drainage procedures; were unable to undergo MRI; had another systemic disease (diabetes mellitus or systemic lupus erythematosis) that could affect GFR; or were pregnant, lactating, or less than six months postpartum. Subjects continued their current medications but were asked not to take nonsteroidal medications for at least 7 d before study. Pain medication intake was defined as the use of at least one prescribed or nonprescription pain medication within 1 mo before study visit at which the SF-36 survey was completed. Types of pain medications were classified as acetaminophens, nonsteroidal anti-inflammatory drugs, opiates, nonopiate analgesics, tricyclic antidepressants prescribed for analgesia, or serotonin uptake inhibitors prescribed for analgesia. Patients with hypertension were those previously diagnosed with hypertension who were currently taking antihypertensive medications, or those with a mean BP of >140/90 mmHg on three consecutive visits during their evaluation in the COHORT study. In the GCRC, the subject's height and weight were determined, and BP was measured, using oscillometric methods, in the arm with the highest BP on 50 occasions, at regular intervals, during the subject's stay. The diet was not restricted, and water loading was used to increase urine flow. Two sequential 24-h urine collections were obtained to determine urinary sodium, potassium, creatinine, albumin, and urea excretion. On the second study day, blood was drawn for hematocrit, serum chemistries, and creatinine level determinations. Estimates of dietary sodium and potassium intake were determined from mean 24-h urinary excretion of sodium and potassium. Serum and urine creatinine concentrations were measured by using a kinetic alkaline picrate assay. Blood and urine urea nitrogen levels were calculated using the urease method. Urinary sodium and potassium concentrations were determined using the flame photometric method. Dietary protein intake (grams per kilogram body weight per day) was estimated as 6.25 [UUN (g/d) + 0.031 (g/kg/d) SBW (kg)], where UUN is urine urea nitrogen, SBW is standard body weight, and 0.031 g/kg/d is a constant reflecting the rate of excretion of nitrogen in compounds other than urea. Urinary albumin excretion was determined by RIA. GFR was measured during the second hospital day. Briefly, 30 min after SSKI was given orally, 35 microcurries of 125-I labeled iothalamate was injected subcutaneously in the arm opposite to the one used for blood sampling. Subjects drank 400 ml of water every 30 min during the study. One hour after iothalamate injection, subjects voided, and if urine flow rates were greater than 4 ml/min, four urine collections of 30 min duration were obtained. Between-period coefficient of variation was 10.0%. After a 6-h fast, MR imaging was performed using a 1.5-Tesla, Philips NT scanner (14,15). Subjects were supine with their arms placed above their head, and body phase array coils were placed over the anterior and posterior portions of the abdomen, beginning at the inferior costal margin and extending over the expected length of the kidneys. After scout films were obtained and instructions for breath-holding given, a breath-held, fast spin, echo T2-weighted sequence was obtained in the coronal projection, with the following parameters: repetition time, TR 3000–5000 msec, echo time, TE 80 msec, matrix 256 × 256, scan percent 75%, field of view 350 mm, RFOV 70%, NSA 1, echo train length 43, slice thickness 3 mm, gap 0. Images were obtained with a scanning time of approximately 23 s. MR images were retrieved to a Sun workstation and analyzed using two image analysis software programs: Easy Vision (Philips Medical Systems, Best-Leiden, The Netherlands) and Brainwork (Emory University). To estimate renal volume, kidney tissue was segmented from other tissues in each image slice using computerized thresholding based on pixel signal intensity which was supported by manual editing (16,17). In each slice, the area of the selected tissue was calculated and these areas integrated across all slices to arrive at a volume estimate for the entire kidney. Renal volumes are reported as the average of both kidneys of an individual. During the GCRC evaluation, ADPKD patients completed the self-administered SF-36 questionnaire during their free time. The SF-36 is a 36-question instrument consisting of eight scales of health assessing physical function, social function, limitation in role due to physical health, limitation in role due to mental health, mental health, vitality, bodily pain, and general health (9,10). These scales have been aggregated into a physical component summary score (or PCS), and a mental component summary score (or MCS) and have been validated in a variety of studies and for multiple chronic illnesses (18) and normalized to the general U.S. population with a mean value of 50 and an SD of 10. Summary statistics including mean (± SD), median, minimum values, and maximum values were calculated to describe the study population. Mean MCS, PCS, and specific component scores were calculated for the overall Cohort study population. Demographic and clinical characteristics of subjects who failed to complete the SF-36 questionnaire satisfactorily were compared with those who completed their questionnaire successfully, using a two-sample t test for continuous variables and a chi square test for discrete variables. Using a two-sample t test, the mean COHORT and individual component scores were compared with those of the general population, African-American patients with chronic renal insufficiency (AASK Study), a northeastern United States hemodialysis population, and the HEMO clinical trial of ESRD subjects (9–12,19). Continuous estimated predictors of PCS and MCS scores included: age, mean renal volume, GFR, BP, pulse pressure, number of BP medications, BMI, dietary sodium, potassium, protein intake, and hematocrit. Spearman correlation coefficients (rs) were used to determine whether these estimated predictors correlated with PCS or MCS score. Patients were categorized into groups based on gender (male versus female), pain medication or no pain medication intake, renal complications (hematuria, urinary tract infections, or nephrolithiasis versus none), renal volume (≥ or <1000 ml), hypertension status (normotensive versus hypertensive), renal function (GFR < 80 ml/min/1.73 m2 versus GFR ≥ 80ml/min/1.73 m2), and education level (no college education versus associate, bachelor, or graduate degree). Comparisons of PCS and MCS scores between the abovementioned subgroups were performed using a two-sample t test for gender, renal volume, and renal function and a Wilcoxon rank sum test for pain medication intake, renal complications, hypertension status, and education level. Subsequent multiple linear regression modeling and ANOVA were used to determine which variables significant in the univariate analysis produced the best prediction model of PCS or MCS score. Models for PCS and MCS scores were determined separately. Corresponding interaction terms were included in the initial model. Backwards elimination was performed, and variables (interaction terms and predictors) that were nonsignificant at the α = 0.05 level were sequentially removed from the model. Stepwise selection was also performed in an iterative manner where variables with a p-value <0.10 were added to the model and variables with a p-value >0.05 were removed. An all-possible regressions strategy was used to determine the best model based on the results from the backward elimination and stepwise selection methods. To avoid inaccuracy in the estimates predicted by the model, we assessed collinearity by examining the variance inflation factor of each parameter estimate for values >10. Statistical analyses were computed using SAS System Version 8.2 (SAS Institute, Carey, NC). Two hundred ten patients diagnosed with ADPKD participating in the Cohort study, who had completed the SF-36 questionnaire, were identified. Sixteen patients (9%) were excluded because they did not complete the questionnaire properly. When compared with the overall study group, the distribution of age, gender, and education level of the 16 patients excluded was not different (data not shown). After excluding those <18 yr of age, 152 subjects were available for analysis. Representation from each of the clinical sites included four subjects from Oregon Health Sciences Center, seven subjects from Beth Israel Hospital, and 141 subjects from Emory University. The clinical characteristics of the Cohort participants in this study are shown in Table 1. 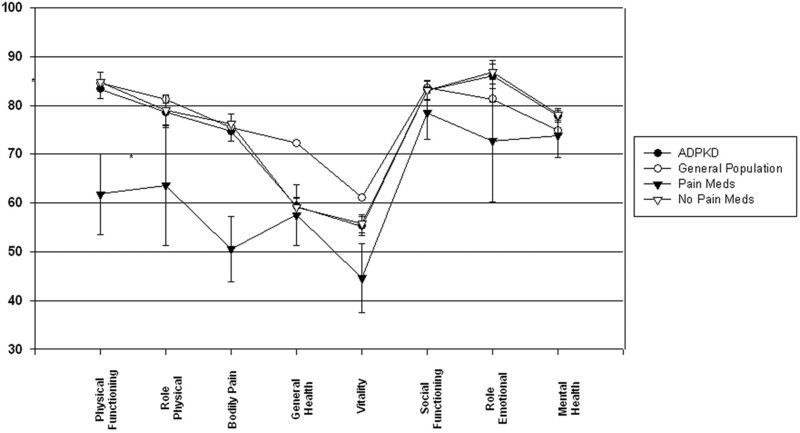 These subjects were divided into two groups based on pain medication use (yes versus no) within 1 mo of evaluation. Variables in the two groups were compared, and only hematocrit values differed, with those taking pain medications demonstrating a significantly higher hematocrit value (P < 0.05). Renal volumes did not differ between those taking and those not taking pain medications. The mean PCS score of the overall COHORT was 46.9 ± 11.3, and the mean MCS score was 51.0 ± 9.0 (Figure 1). There was no statistically significant difference in either score compared with the general U.S. population (9,10). These comparisons remained consistent when the individual scales of health that make up the SF-36 questionnaire were compared between the Cohort and the US population (Figure 2). 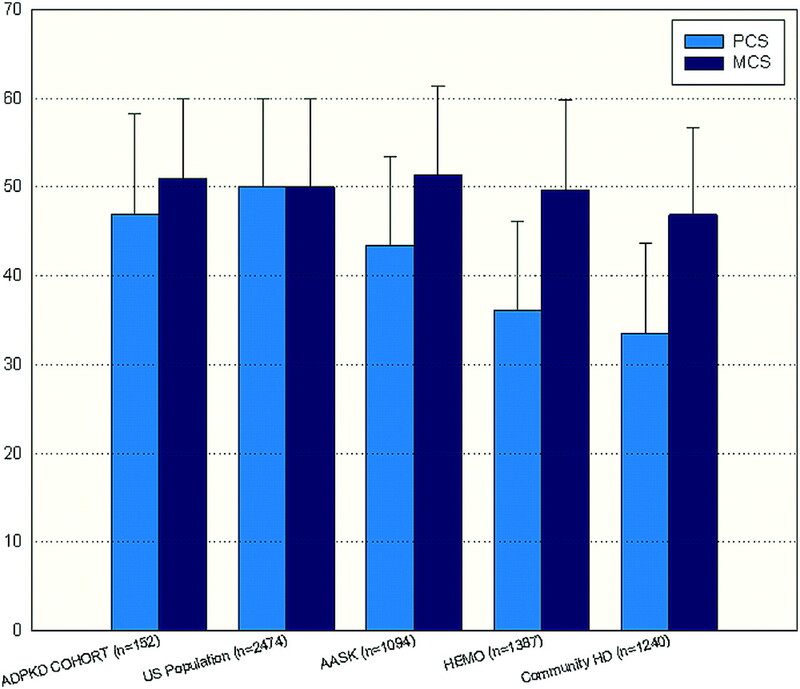 Comparison of mean PCS and MCS scores in the General US Population, the ADPKD COHORT, the clinical trial HEMO Study subjects, the AASK Study subjects, and a Community-based Dialysis Population. No differences were found between the ADPKD COHORT and the General Population. *Statistically significant difference with P < 0.05 for PCS scores between the ADPKD COHORT and the HEMO population. Statistically significant differences with P < 0.05 for both PCS and MCS were found between the ADPKD COHORT and a Community-based Dialysis Population. Comparison of the mean individual scales of health of the SF-36 questionnaire between the COHORT and the general population and between the pain medication groups. The first four scales on the x axis generate the PCS score, and the last four scales on the x axis generate the MCS score. *Statistically significant differences (P < 0.01) in the physical function and bodily pain indexes were found between those taking and not taking pain medications. Cohort study patients with GFRs between 20 and 65 ml/min/1.73 m2 were identified and then compared with the African American population from the African American Study of Kidney Disease (AASK) trial who were recruited within this range of GFR (11). The AASK participants demonstrated a PCS score of 43.4 ± 10 and a MCS score of 51.3 ± 10.1, P NS versus Cohort. However, PCS and MCS scores were significantly higher in Cohort compared with a clinical trial hemodialysis group (HEMO: PCS: 36.1 ± 10, P < 0.01; MCS: 49.7 ± 10.1, P < 0.05) and a community-based hemodialysis population (PCS: 33.5 ± 10.1, P < 0.01, MCS: 46.9 ± 9.8, P < 0.05) (Figure 1). The AASK, HEMO, and community dialysis population had a frequency of hypertension of 100%, 91% and 95% respectively. When comparing the PCS and MCS scores of the Cohort participants based on gender, renal volume, or hypertension status, there were no differences in scores (Table 2). However, those who were taking pain medications had significantly lower PCS (39.2 ± 10.6 versus 47.5 ± 11.2; P < 0.05), physical function index (61.8 ± 27.4 versus 84.8 ± 22.5; P < 0.005) and bodily pain index scores (50.6 ± 22.2 versus 76.2 ± 24.4; P < 0.005) as compared with those who were not taking pain medications (Figure 2). Those with an education level of college or higher demonstrated significantly higher mean PCS (48.9 ± 9.8 versus 41.1 ± 13.2; P < 0.01) and MCS scores (51.8 ± 8.6 versus 48.3 ± 10.4; P = 0.05) as compared with those without a college education. Those with GFR ≥ 80 ml/min/1.73 m2 demonstrated significantly higher PCS scores (50.3 ± 9.7 versus 45.1 ± 9.7; P = 0.01) as compared with those with GFR < 80 ml/min/1.73 m2. In addition, PCS scores correlated with the level of renal function in the Cohort study group, PCS (P = 0.0005, r = 0.29; Figure 3). Specifically, physical function index (P = 0.001, r = 0.27; data not shown) and general health index scores (P < 0.001, r = 0.29; data not shown) positively correlated with GFR level. However, neither the PCS score nor any of the individual component scores (i.e., specific bodily pain component score) correlated with mean renal volume (r = 0.06, P = 0.452, data not shown). 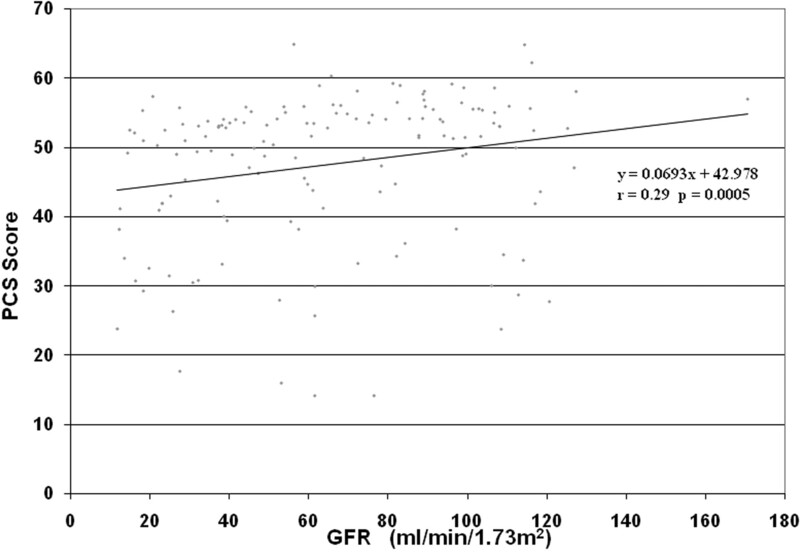 Scatter plot of PCS versus GFR shows a significant relationship, P = 0.0005 and a correlation factor of r = 0.29. Univariate analysis comparing the potential contributors to the PCS score demonstrated that GFR (r = 0.29, P = 0.0005) and protein intake (r = 0.29, P = 0.0003), age (r = −0.24, P = 0.0024), pulse pressure (r = −0.20, P = 0.0159), number of pain medications (r = −0.20 P = 0.0321), and BMI (r = −0.31 P = 0.0001) correlated with PCS scores. Similar univariate analysis demonstrated a correlation between the MCS score and pulse pressure (r = −0.22, P = 0.0058). Using those variables significantly associated with the PCS or MCS scores, multiple regression analysis demonstrated that age, BMI, education level, pulse pressure, and pain medication use independently associate with PCS score and account for 32% of the variability of the measurement (R2). (Table 3). The strength of the association (R) between these predictor variables and PCS score was 0.56. In this study, we quantified the physical and mental well-being of ADPKD patients not yet on dialysis, using the validated SF-36 questionnaire. In 152 ADPKD adults, no differences in quality of life could be detected compared with the general U.S. population, and in those with established renal insufficiency, no differences were found compared with an African American predialysis renal disease population with similar levels of renal function. Importantly, 32% of the variability of the PCS score in predialysis ADPKD individuals could be accounted for when including BMI, age, pulse pressure, and pain medication use. The PCS component of the SF-36 appeared to be more sensitive than the MCS, for which only pulse pressure correlated significantly (r = −0.22 P = 0.0058). This observation is similar to other studies of different chronic diseases and other studies of renal failure patients, in which the only factors consistently shown to relate to MCS scores include age, socioeconomic status, and mental illness (12,20,21). Importantly, this study supports the original observations made in other chronic kidney disease populations that the SF-36 questionnaire does not provide the sensitivity necessary to detect clinically relevant dissatisfaction with quality of life and, specifically to ADPKD, is inadequate to detect changes that relate to increasing cystic burden with age. Although the Cohort population is a relatively unselected group of ADPKD patients, there are two exclusion criteria for entry into this study that may artificially inflate both PCS and MCS scores. These include the exclusion of patients already receiving renal replacement therapy and those with previous renal surgery. Both conditions are associated with more severe disease in ADPKD (15), and therefore this population may underrepresent the more severely affected individuals. In this study, dialysis patients demonstrated significantly lower PCS and MCS scores than the ADPKD cohort participants indicating the impact of ESRD on the SF36 scores. In addition, when ADPKD patients were compared with another chronic renal disease with hypertensive nephrosclerosis with significant ethnicity differences (AASK), PCS and MCS scores did not differ. Clinically AASK patients are relatively asymptomatic compared with ADPKD individuals. Therefore, it is likely that the SF-36 questionnaire is not sensitive to detect changes in quality of life in ADPKD patients. Given the association between renal size and gross hematuria and pain, as well as the close relationship between kidney size and GFR (22), it was anticipated that renal volume would inversely relate to SF-36 scores, particularly the PCS component, in this study. However, no relationship between increasing renal volume or renal volumes >1000 ml and PCS, MCS, or individual component scores could be found. Also surprising was that although PCS scores were significantly lower in individuals receiving pain medications, mean renal volumes did not differ. These observations suggest that features other than renal size (e.g., cyst location, systemic inflammatory response) may contribute more to the development of pain in ADPKD individuals. Importantly, those ADPKD individuals who would most often undergo renal surgery to treat debilitating pain were excluded from participating in this study. Renal volume was not associated with changes in PCS or MCS scores in this study. In addition, complications related to ADPKD that were captured in this study, including hematuria, infection, and calcifications that relate to renal size (6–8), did not relate to PCS or MCS scores. The results of this study may reflect that ADPKD patients are generally very motivated to cope with their disease. However, these same results raise the question of whether the SF-36 is an appropriate tool to evaluate quality of life in pre-ESRD chronic kidney disease populations such as those with ADPKD. Although mean PCS and MCS scores in Cohort study did not differ from the general U.S. population, level of renal function significantly associated with PCS scores in a dichotomous and continuous fashion in the univariate analysis in the Cohort study. Age and renal function are closely associated in ADPKD (1) and most likely accounts for the presence of age as an independent contributor to the PCS score in the multivariate analysis. Patients with ESRD in both community and clinical trial settings had significantly lower PCS and MCS scores than reported in this predialysis ADPKD population. Both diabetes and nutritional status are linked to PCS and MCS scores (23). Importantly, there were no diabetic subjects in this COHORT, and all were relatively healthy and demonstrated good nutritional status based on their estimated dietary protein intake (data not shown). The absence of these important comorbidities may account for the differences seen. Significant independent contributors to the PCS scores in this study were found, with 32% of the variability of the scores (R2) accounted for. The strength of the association (R) between the predictors and PCS score was 0.56. Pain medication use and pulse pressure were negatively correlated with PCS scores. Age and BMI were negatively, and education level positively, correlated with PCS scores, as has been reported in other renal disease (both pre-ESRD and ESRD populations) (24,25) as well as other chronic diseases (26). The association of increased education level with a better quality of life has also been represented by greater income levels and was also found in this study (data not shown). Pulse pressure remained an independent contributor to the PCS score and is an indirect measure of vascular compliance that is altered in the hypertensive state and in individuals with renal insufficiency (27). Pulse pressure may represent more severe disease in ADPKD individuals with renal insufficiency and hypertension (1). Consistent with this was the significant relationship between renal function and PCS scores found in the univariate analysis in this study, as has been reported in other population-based cohorts (28). In summary, relatively few variables were significantly associated with SF-36 scores in a large, relatively unselected population of pre-ESRD ADPKD patients. The variables found to account for the variability of the PCS and MCS scores in this population are similar to those identified in a variety of chronic medical diseases. These findings suggest that this questionnaire may not have the sensitivity or specificity to detect quality of life changes that occur in ADPKD patients. The development of disease-specific, reliable and validated questionnaires that can accurately assess physical and mental well-being in ADPKD patients is warranted. This study was supported by the General Clinical Research Center Grant MO1-RR00039 for the Division of Research Resources, National Institutes of Health, and the Polycystic Kidney Disease Foundation. These data were presented in part at the American Federation of Clinical Research, Southern section 2003 Annual Meeting. Maschio G, Alberti D, Janin G, Locatelli F, Mann J, Motolese M, Ponticelli C, Ritz E, Zucchelli P: Effect of the angiotensin-converting-enzyme inhibitor benazepril on the progression of chronic renal insufficiency. The Angiotensin-Converting-Enzyme Inhibition in Progressive Renal Insufficiency Study Group. N Engl J Med334 :939– 945,1996 . Helder DI, Kaplein AA, van Kempen GM, van Houwelingen JC, Roos RA: Impact of Huntington's disease on quality of life. Movement Disorders16 :325– 330,2001 . Bajwa ZH, Gupta S, Warfield CA, Steinman TI: Pain management in polycystic kidney disease. Kidney Int60 :1631– 1644,2001 . Gabow PA, Duley I, Johnson AM: Clinical profiles of gross hematuria in autosomal dominant polycystic kidney disease. Am J Kidney Dis20 :140– 143,1992 . Levine E, Grantham JJ: Calcified renal stones and cyst calcifications in autosomal dominant polycystic kidney disease: Clinical and CT study in 84 patients. AJR159 :77– 81,1992 . Ware JE: SF-36 Health Survey: Manual and Interpretation Guide. Boston, The Health Institute, New England Medical Center1993 . Ware JE, Kosinki M, Keller SD: SF-36 Physical and Mental Health Summary Scales: A User's Manual. Boston, The Health Institute,1994 , pp4.1– 4.6. Kusek JW, Greene P, Wang SR, Beck G, West D, Jamerson K, Agodoa LY, Faulkner M, Level B: Cross-sectional study of health-related quality of life in African Americans with chronic renal insufficiency: The African American Study of Kidney Disease and Hypertension Trial. Am J Kidney Dis39 :513– 524,2002 . Dwyer JT, Larive B, Leung J, Rocco M, Burrowes JD, Chumlea WC, Frydrych A, Kusek JW, Uhlin L, Hemodialysis Study Group: Nutritional status affects quality of life in Hemodialysis (HEMO) Study patients at baseline. J Renal Nutr12 :213– 223,2002 . Ravine D: Evaluation of ultrasonographic diagnostic criteria for autosomal dominant polycystic kidney disease. Lancet1 :824 ,1994 . Chapman AB, Guay-Woodford LM, Grantham JJ, Torres VE, Bae KT, Baumgarten DA, Kenney PJ, King BF Jr., Glockner JF, Wetzel LH, Brummer ME, O'Neill WC, Robbin ML, Bennett WM, Klahr S, Hirschman GH, Kimmel PL, Thompson PA, Miller JP: Renal structure in early autosomal dominant polycystic kidney disease (ADPKD): The Consortium for Radiologic Imaging Studies of Polycystic Kidney Disease (CRISP) cohort. Kidney Int64 :103– 145,2003 . Grantham JJ, Torres VE, Chapman AB, Guay-Woodford LM, Bae KT, King BF Jr., Wetzel LH, Baumgarten DA, Kenney PJ, Harris PC, Klahr S, Bennett WM, Hirschman GH, Meyers CM, Zhang X, Zhu F, Miller JP, CRISP Investigators: Volume progression in polycystic kidney disease. N Engl J Med354 :2122– 2130,2006 . Arya K, Brummer M, Ernst R, Chapman AB: Renal blood flow (RBF) is decreased in polycystic kidney disease (ADPKD) children: Relationship to renal (RV) and cyst volume (CV) using magnetic resonance imaging (MRI). J Am Soc Nephrol11 :386A ,2000 . Chapman AB, Zimmer S, Paxton W, Dixon T, Redvanly R: Structure-function relationship in autosomal dominant polycystic kidney disease (ADPKD) subjects using magnetic resonance imaging for determination of renal volume (RV) and single injection renal for clearance of I125 Iothalamate (GFR). J Am Soc Nephrol10 :415A ,1999 . Mingardi G, Cornalba L, Cortinovis E, Ruggiata R, Mosconi P, Apolone G: Health-related quality of life in dialysis patients. A report from an Italian study using the SF-36 Health Survey. DIA-QOL Group. Nephrol Dialysis Transpl14 :1503– 1510,1999 . Lopes AA, Bragg-Gresham JL, Satayathum S, McCullough K, Pifer T, Goodkin DA, Mapes DL, Young EW, Wolfe RA, Held PJ, Port FK: Health-related quality of life and associated outcomes among hemodialysis patients of different ethnicities in the United States: The Dialysis Outcomes and Practice Patterns Study (DOPPS). Am J Kidney Dis41 :605– 615,2003 . Frank L, Kleinman L, Rentz A, Ciesla G, Kim JJ, Zacker C: Health-related quality of life associated with irritable bowel syndrome: comparison with other chronic diseases. Clinical Therapeutics24 :675– 689;2002 . Sesso R, Rodrigues-Neto JF, Ferraz MB: Impact of socioeconomic status on the quality of life of ESRD patients. Am J Kidney Dis41 :186– 195,2003 . Grantham JJ, Chapman AB, Torres VE: Volume progression in autosomal dominant polycystic kidney disease: The major factor determining clinical outcomes. Clin J Am Soc Nephrol,1 :148– 157,2006 . Lowrie EG, Curtin RB, Lepain N, Schatell D: Medical outcomes study short form-36: A consistent and powerful predictor of morbidity and mortality in dialysis patients. Am J Kidney Dis,41 :1286– 1292,2003 . Merkus MP, Jager KJ, Dekker FW, de Haan RJ, Boeschoten EW, Krediet RT: Physical symptoms and quality of life in patients on chronic dialysis: Results of The Netherlands Cooperative Study on Adequacy of Dialysis (NECOSAD). Nephrol Dialysis Transpl14 :1163– 1170,1999 . Diaz-Buxo JA, Lowrie EG, Lew NL, Zhang H, Lazarus JM: Quality-of-life evaluation using Short Form 36: Comparison in hemodialysis and peritoneal dialysis patients. Am J Kidney Dis35 :293– 300,2000 . Camacho F, Anderson RT, Bell RA, Goff DC, Jr., Duren-Winfield V, Doss DD, Balkrishnan R: Investigating correlates of health related quality of life in a low-income sample of patients with diabetes. Qual Life Res11 :783– 796,2002 . London G, Guerin A, Pannier B, Marchais S, Benetos A, Safar M: Increased systolic pressure in chronic uremia. Role of arterial wave reflections. Hypertension20 :10– 19,1992 . Chow FY, Briganti EM, Kerr PG, Chadban SJ, Zimmet PZ, Atkins RC: Health-related quality of life in Australian adults with renal insufficiency: a population-based study. Am J Kidney Dis41 :596– 604,2003 .